Includes everything you need to set up a hydraulic system for your dump application. Choose the combination of side-mount reservoir size and material for your needs. All brackets, hoses, fittings, fasteners and other hardware included. Pumps can be ordered clockwise or counterclockwise. The Side-Mount Reservoir/Direct Mount Pump Wetline Kit from Buyers Products has everything you need to set up a hydraulic system for dump applications. Choose from a steel or polymer reservoir with a 50 or 70 gal capacity. All versions come with a cast iron pump/valve assembly rated at 46 GPM at 1800 RPM. Specify clockwise or counterclockwise rotation based on the PTO operation. Contact Customer Service for assistance. 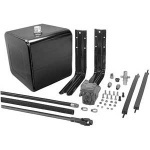 The wetline kit includes: (1) Side mount reservoir; (1) Reservoir bracket kit with fasteners; (1) 46 GPM at 1800 RPM cast iron pump/valve combination with brackets; (1) Internally reinforced 1-1/4 in. suction hose, 6 ft long; (2) 1-1/4 in. barbed adapter fittings; (2) 1-1/4 in. stainless steel hose clamps; (1) 1-1/2 in. by 1-1/4 in. reducing bushing; (1) 1 in. high pressure swivel adapter; (1) 1 in. wing-type high pressure quick detach coupler; (1) 1 in. high pressure hose, 6 ft long. High-quality aluminum construction for lighter weight and excellent heat dissipation. Choose 50 gal or 70 gal reservoir. 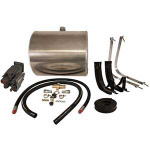 The Aluminum Side-Mount Reservoir Wetline Kit from Buyers Products has everything you need to set up a dump hydraulic system. The reservoir features high quality aluminum construction for lighter weight and excellent heat dissipation. 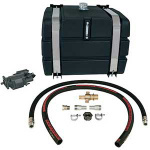 The kit contains: (1) Side-mount 50 gal or 70 gal aluminum reservoir; (1) Reservoir bracket kit with fasteners; (1) 46 GPM at 1800 RPM cast iron pump/valve combination; and all brackets, hoses, adapters, clamps, and fittings. Bolts right to your PTO for a compact and efficient source of hydraulic power. Designed to handle dump operations with 2 or 3 line plumbing. Includes a 4 bolt SAE mounting flange and 7/8 by 13 spline shaft. The Direct Mount Hydraulic Dump Pump with Manual Valve from Buyers Products directly mounts to your PTO for a compact and efficient source of hydraulic power. It is designed for dump operations with 2 or 3 line plumbing and comes set up for standard cable-controlled shift operation. It's also available with air cylinder to convert to pneumatic control on shifter spool. You will need to specify the pump rotation when ordering, which you can determine by looking at the pump with the shaft facing you and the belly of the pump facing down.